The branch works in conjunction with the Cuban Institute of Friendship with the Peoples (ICAP) based in Havana. In early 2015 the society completed their latest project, funding the digitising of medical records in Granma Province. Prior to that we undertook a project to develop environmental education programs in the University of Las Tunas. 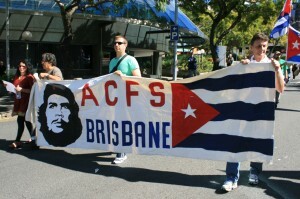 In 2005 the ACFS Brisbane, in conjunction with other branches in Sydney, Perth, Adelaide finalised the payment for refurbishment of the climate control facilities in the Camilo Cienfuegos University Hospital in Sancti Spiritus. Previously the Brisbane Branch had funded, along with branches in Adelaide and Perth, the purchase of solar panels for a remote medical centre in Granma Province. The society offers support for visiting Cubans particularly for those on official business, such as visiting scientists, conference attendees, medical workers and athletes.